This will always be one of my favourite pieces of work. The original image was captured by Mr. Dave Salmond whilst working in the outskirts of Ladysmith. This woman was known as ‘the preacher’s wife’ and had been married to the local preacher for many years. The typical miss-matched items of clothing bring such originality and character to the piece. The holes in her shoes which reveal the big toe on each foot always get a mention when people view this work. My favourite thing about this scene is the expression reflected in her face, the scene is simplistic and carefree. Each time I look at this painting I just feel happy. 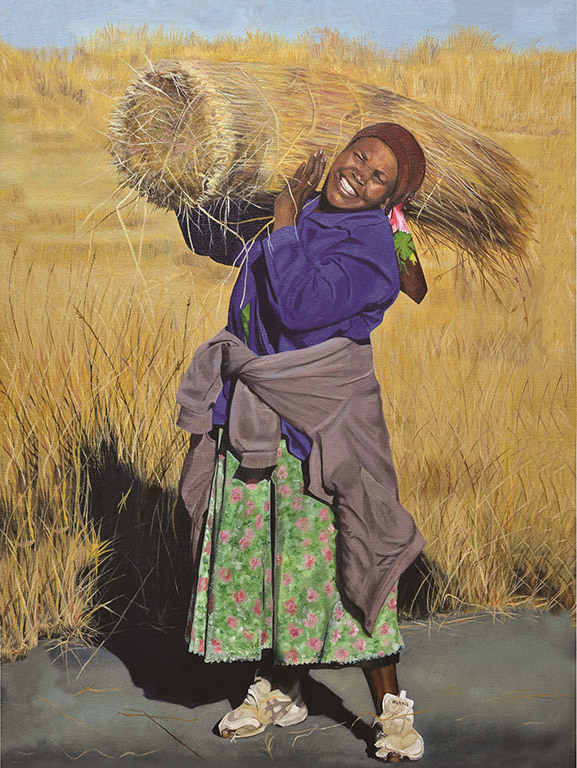 I have subsequently entitled the work ‘Nonjabulo’ which in Zulu simply means ‘happiness’.